Looking for the Use of the Lucky Bamboo for Good Feng Shui? Here we are with some suggestions on Where to Place the Lucky Bamboo, Why is the Lucky Bamboo Considered Lucky, Lucky Bamboo and the 5 Elements, Significance of the Number of Bamboo Stalks, How to take Care of lucky bamboo and lots more. Bamboo is very popular Feng Shui cures which represents the symbol of good fortune and prosperity in Asian culture for more than 4,000 years. We can get the full use of Lucky Bamboo only when it is placed properly in the home and cared for well. Lucky Bamboo (Dracaena sanderiana) attracts health, prosperity and good fortune for business owners and homes. It can be use as a gifting option to anyone you wish good fortune, health and abundance. It grows towards the light, and can be easily trained into interesting, decorative shapes and need very less water and light to grow so it is the best indoor plant for your home or office. 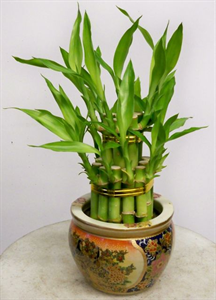 Lucky Bamboo adds luck and beauty in your life so it is very useful plant. It invigorates your love life and brings long and peaceful life in terms of health. For people focusing on career and business, it symbolizes success and growth. In a Buddhist view, it symbolizes graciousness, honor and virtue. The lucky bamboo brings peaceful and wise energy into your home or office. It not only helps in your home décor but also brings good luck and prosperity for all as it is green, tall and has vertical shape a perfect example of the wood element which influences our life energy, vitality and physical activity. We can learn lots of thing from this plant; it can grow in poor light and adverse conditions and still be strong so it teaches us that how we can survive and be open-minded to ensure that Chi flows and sets you spiritually free. It can attract the flow of the positive chi energy wherever it is placed. Lucky Bamboo is considered when you receive it as a gift from your loved one so it could be a good gifting option also. It is very much important to place the Lucky bamboo in right direction of your home or office. The best direction to place your bamboo tree is east or southeast corner of your home as the Eastern section of the home or office represents family so place a Bamboo plant with three stalks in this area. For inviting wealth and prosperity the plant should be placed in the wealth area of your home and to activate the positive energy Southeast direction is the best. To use Lucky Bamboo for Feng Shui, it must represent all five elements of Feng Shui i.e. earth, fire, metal, water, and wood. - Earth: Use rocks, pebbles and clay as the substitutes for earth to grow your luck bamboo tree. - Fire: Tie a red color or any other bright color ribbon on your vase or pot which symbolize the fire. - Metal: Put a metal coin (gold, silver, copper, bronze and brass) in the pot or use glass pots to grow bamboo tree to represent the metal. - Water: It is very much important to fill the lucky bamboo container with water every time to sustain its life. According to Feng Shui the Yang (odd numbers) are considered to be most lucky and hence the number of bamboo stalks determines your luck to a large extent. It is very much important to take good care of lucky bamboo so that it can survive for long. 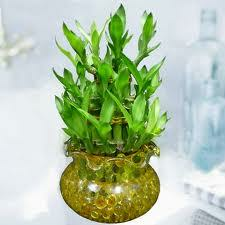 It is very easy to grow lucky bamboo you need container, clean water and polished stones to keep the stalks upright. Choose a pot or vase that is approximately 2 inches larger than the plant itself. It is good not to use the tap water as it contains fluoride but if you have no other choice than let it sit out overnight before using. Change the water on regular intervals of time (once in a week or 15 days). Don't fill the container too full keep water levels at approximately an inch from the base of the canes. Never put your plant in direct sunlight as too much direct sunlight can cause the leaves to burn. They will grow well under artificial lighting and normal household temperatures. If you find that leaves start to turn yellow than use filtered or distilled water and trim yellow leaves with a sharp clean scissors. Do you want to know about the Feng Shui products /symbols? What change can Feng Shui products bring your life? How to apply Feng Shui products /symbols? Read the following article to get answers of your all queries related to Feng Shui products /symbols uses and applications.